The very entertaining presentation given by Piers Corbyn at the Electric Universe 2014 conference is available on YouTube. In his talk, Piers Corbyn described the failure of standard meteorology (SM) in outlook, theory, and practice. He included: signals in real meteorology data unexplained by SM; real role of jet stream, stratosphere, electro-jets, magnetosphere, solar wind, solar corona, and the Moon; the total inability of SM to explain: sudden stratospheric warmings and its consequences, tropical storm intensifications, angular momentum concentration in tornadoes; and the need for something else such as electromagnetic plasma explanations; the theoretical basis of non-standard long range weather forecasting on a real planet; a summary on his WeatherAction forecasting skill and examples; and the future of forecasting and meteorology, climate ‘science’ and science in general. Piers Corbyn is well known for producing stunning long range weather forecasts that are published via his http://www.weatheraction.com website. It appears from his EU2014 presentation that Piers Corbyn’s outlook is very much aligned with the work of Dr Timo Niroma. Anyone interested in the works of Timo Niroma may find the following links helpful. Are there any signs of a global warming in Uppsala temperatures in 1739-1999? Was the early man a wader? Gallery | This entry was posted in Astrophysics, Earth, Maunder Minimum, Solar System. Bookmark the permalink. Thank you Tim. Good to see Piers get the extra exposure. Thanks also for the Timo links – very useful indeed. I think I found the mechanism that governs 220 year long range solar cycle discovered by Dr. Timo Niroma. The ~20 year solar cycle of Sun, Jupiter and Saturn, combined with the ~11 year half integral solar cycle, would generate a 220 year prominent precession cycle for the Sun (20×11). In December 1650, when the Maunder Minimum event occurred, the Solar System arrangement was a superior conjunction with almost aligned Saturn-Sun-Jupiter-Uranus-Neptune. In 1850 the Solar System arrangement was aligned Jupiter-Sun-Moon-Earth-Saturn-Uranus-Pluto, and this is essentially a superior conjunction of Jupiter, Sun, and the barycenter of these other Solar System objects in a precession cycle with Earth also aligned. In December 2031, the arrangement of Solar System objects is a superior conjunction of almost aligned Uranus-Saturn-Earth-Sun-Jupiter; this is a catalyst for manifesting a Little Ice Age event on Earth in 2031 that synchronizes with an expected period of low solar activities. 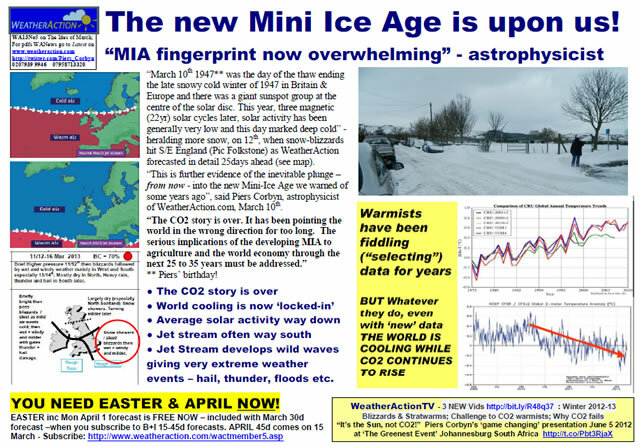 It does look like Earth is heading toward a period of Little Ice Age and would reach its coldest climate in 2031 as suggested by Dr. Timo Niroma.